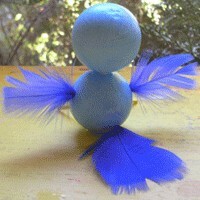 This little Bluebird of Happiness is even simpler to make than it looks. Once kids get the hang of using a skewer to make holes in the polystyrene they will happily come up with their own exotic bird species! 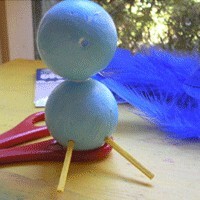 Attach head and body using half a matchstick and a spot of glue. Then stick matchstick legs into the body. Use a skewer to make holes for two wings, a tail and a feather on the top of the head. Then stick in the feathers. Glue on googly eyes and use half a match stick as a beak.